Newly elected Alumni Group Coordinator Essa Remoquillo with DepEd Undersecretary Chito Gascon. Members of the Friedrich Naumann Foundation’s (FNF) Alumni Group met at the Foundation’s office on June 9, 2005 to exchange information and discuss the future of the informal association. The 25 attendees agreed that the Group should meet as “a loose network” of individuals who have attended leadership training programs sponsored by the liberal Foundation in Europe. The Group also agreed that it would join hands with the Foundation in organizing educational and other social activities aimed at sharing experiences, promoting the liberal cause and also strengthening the network. Five members of the Group were elected to the “convenors’ group”: They are Atty. Arpee Santiago (Ateneo Human Rights Center), Atty. Leah Olores (National Institute for Policy Studies), Essa Remoquilo (Office of Senate Majority Leader Kiko Pangilinan), Atty. 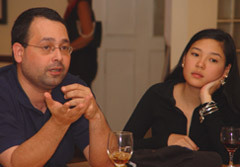 Che Carpio and Odette Padilla. They elected Ms. Remoquillo as the Coordinator of the Alumni Group. The next activity of the alumni group will be a lecture and discussion meeting with the FNF’s Head of the Asia Desk, Mr. Siegfried Herzog who during his upcoming visit to Manila will hold a talk on “Globalization, the European Union and liberal politics in Germany” at the CALD-YLDA-FNF-office on Wednesday, June 22, 2005, at seven o’clock in the evening. Send an e-mail if you wish to attend this meeting.